Server monitoring is crucial to the success of any network. The open source route is typically popular and Nagios is one of the best free open source monitoring tools on the web. 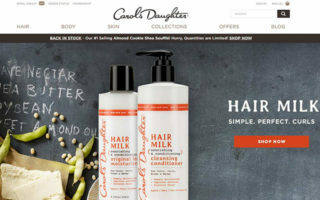 But learning to use this program can be a real hassle without any prior experience. That’s why I’ve curated the best Nagios books to bring you from a complete novice to a skilled power user for everyday tasks. 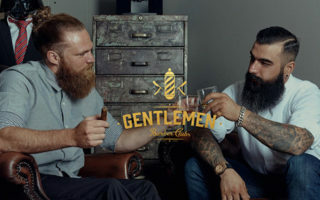 Regardless of your background whether you’re a server admin or network tech or anything else in-between, this post is guaranteed to have something for you. 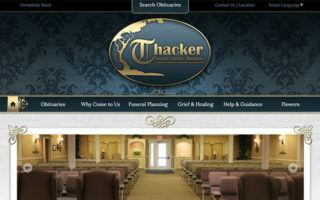 So take a look and see what you think! 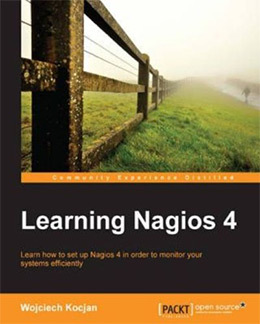 If you’re completely new to monitoring and network tooling then check out Learning Nagios 4. This book covers all the newest updates to Nagios and it teaches the program in a very accessible manner. The book’s author is a seasoned server admin with 10+ years experience so he’s certainly a trusted resource on this topic. Smaller commercial companies and huge enterprise networks can both benefit from a Nagios setup. In Nagios: Building Enterprise-Grade Monitoring Infrastructures you’ll learn the basics of how Nagios works both in theory and practice. The author David Josephsen has years of experience in many different technology stacks. His knowledge shines across the entire Nagios workflow and his writing style is very easy to understand. You’ll learn how to work with the default features and enhance the monitoring system through modules. These include 3rd party tools like Op5 Merlin and SFlow along with tech tips for building your own custom modules from scratch. This book spans 300 pages and it’s one of the easiest introductory books for newbies. You should already have some level of comfort working in IT or in server environments. But you can start this book with zero prior knowledge and work through the lessons if you put in some elbow grease. One of the simplest ways to learn Nagios is through technical practice. Learning Nagios 4 teaches how to setup and monitor a new installation of Nagios on a local machine. You’ll learn about the basic monitoring and configuration settings along with best practices for a common Nagios workflow. The author Wojciech Kocjan has over a decade’s worth of experience working as a systems administrator. He teaches Nagios from the ground-up explaining the basics in a simple manner that should be easy to consume regardless of your skill level. He also gets into Nagios extensions by teaching you to write your own plugins with Perl or Python. You’ll learn about the Nagios web interface and how to connect into the network directly through a shell script. This book offers one of the simplest introductions into the Nagios workflow. It’s practical yet genuine and you’ll find a ton of handy diagrams littered throughout these pages. 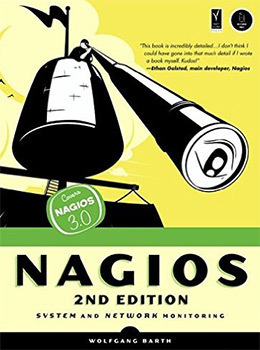 And since the author frequently updates this book it’s worth keeping an eye out for a new edition once we get a stable release of Nagios 5. I need to clarify that this book is damn short and it’s only meant as a quick intro guide to Nagios. 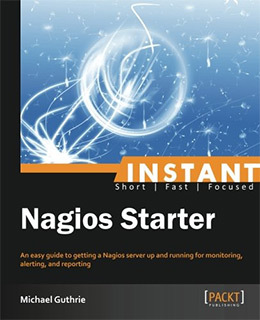 Totaling about 50 pages long, Instant Nagios Starter is a complete newbie’s guide to the program. You’ll learn how Nagios works and how to get it running on a basic Linux/Unix environment. The author spares no expense to explain each step in great detail. However this book does not get in-depth with complicated features or technical solutions to common problems. Most beginners will skip over this book since it’s so generic and surprisingly pricey for such a short intro. But it does offer real training with Nagios covering the initial setup, the dashboard, and the external features you can add for custom tracking and data visualization. Honestly though if you need a real intro book I would instead suggest Learning Nagios 4. It covers much more detail and while it is more expensive, it’s also a book you’ll want to keep on your bookshelf. 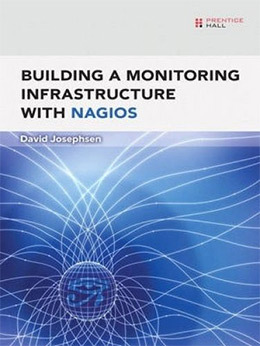 If you’re ready for practical examples with real code solutions then consider grabbing a copy of David Josephsen’s Building a Monitoring Infrastructure with Nagios. 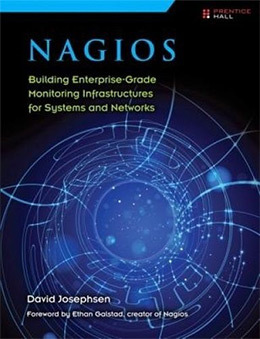 This book teaches you everything about Nagios for a local network and local monitoring on any system. The early chapters teach how to install Nagios on any system from Linux, Unix, and Windows machines. 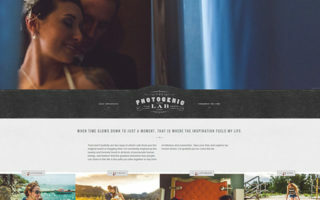 David also shares his advice for using extra tools and monitoring features to improve your workflow. Later chapters delve into visualization libraries to show charts and diagrams from your Nagios logs. He also shares common pitfalls to avoid and more technical solutions to problems you’re likely to face in larger enterprise environments. There are plenty of code samples for building modules and running scripts locally to connect into Nagios. Code snippets run in C, Perl, and basic Unix shell scripting. You should have some prior experience writing code but you don’t need to be an expert to follow along. I’d recommend this book to intermediate-level users who know a bit about Nagios and want to learn how it works in the real world. David’s lessons are practical yet detailed and this book can keep you busy for weeks or months on end. One thing I really like about this book is that it’s platform-agnostic. 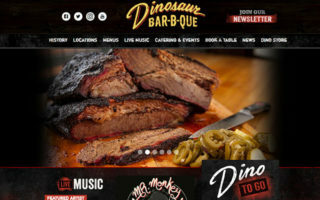 Server monitoring is not a new concept and there are dozens of programs you can use for different services like visitor traffic, database queries, CPU/memory, and other related metrics. Effective Monitoring and Alerting by Slawek Ligus teaches the fundamentals behind quality server monitoring. You’ll learn how to monitor every crucial metric in your chosen stack and how to combine it all together into one dashboard. The author has years of experience working in systems administration & devops at many larger tech companies. He shares anecdotal evidence from his personal experiences working on large enterprise applications. This book will not help you understand the intricacies of Nagios. But it will make you a much better IT/server admin and it’ll teach you how to properly monitor different systems. Each chapter seems to build upon the next and the writing style is super easy to read. A beginner could pick up this book along with a Nagios intro book and learn everything needed to get moving with practical monitoring on the web. Currently in its second edition, Nagios: System and Network Monitoring is one of the best tools for system administrators and network engineers either working or aspiring towards the field. This book shares tips for monitoring all the core protocols like SMTP/POP3, HTTP, and SSH along with many others. You’ll also learn how to monitor local resources on the server which include CPU usage, memory usage, and the full list of programs operating in the background. The author Wolfgang Barth is a professional sysadmin and he shares many workflow tips to improve your Nagios experience. This book walks you through initial setup, configuration, and plugin selection for installing features you’ll need in your Nagios workflow. You’ll also learn how to setup alerts to help you automate tasks and solve problems as they occur in real time. One downside is that the current book only covers Nagios 3. But since most features carry over there’s little reason for this to cause any concern, especially for new Nagios users who won’t notice much of a difference. 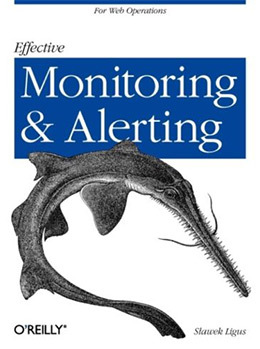 Excellent book for beginners and it’s definitely one of the best you can buy for local monitoring with Nagios. If you just want to learn Nagios then this book might not interest you very much. However networking protocols and solutions are often crucial to the success of any great server stack. 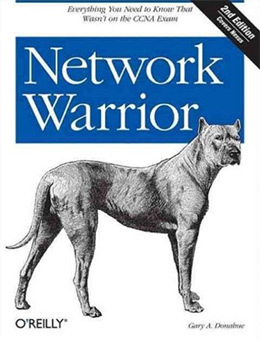 Network Warrior by Gary A. Donahue covers a massive 788 pages worth of networking tips, tricks, and workflows. This book is a powerful resource for server administrators and network engineers who want to understand the latest tech like IPv6 and the Network Time Protocol(NTP). You’ll learn about the basics of internal networking and routing within a system. Gary also shares advice for common issues that arise during troubleshooting, along with best practices for solving major problems before they even occur. This is perhaps the largest book on the topic of networking from small businesses to huge enterprise corporations. You do not need to know any of the information in this book to master Nagios. However this book will dramatically improve your knowledge of networking which can be invaluable if you’re looking for a career in IT. 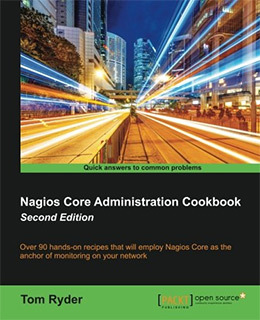 The incredible 380-paged Nagios Core Administration Cookbook is now in its second edition with many recipes updated for Nagios 4.x. What I like most about this book is the variety. 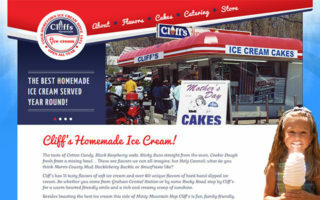 You’ll find recipes targeting small local networks and enterprise businesses plus everything inbetween. Most recipes in this book offer solutions for any size network and they all include reusable code snippets where appropriate. Recipes span the gamut helping you build custom modules and even helping you run tests on those modules to make sure they’re operating properly. You’ll learn how to organize alerts as they come in and sort them by highest priorities. Reporting and logging can be automated including data backups of all logs. These Nagios recipes can save you time and headaches if you study how they work and implement them properly in your setup. However you will need experience working with Nagios before you can reference this cookbook. It is not for beginners and it’s actually a powerful desk reference even for more advanced Nagios users. But if you’re frequently working with a Nagios stack and you need a bulk list of Nagios solutions and best practices then this book is a must-own resource. Technical monitoring has never been easier and open source programs like Nagios make the process a breeze. But if you’ve never done monitoring before the learning phase can be intimidating. For complete beginners I would recommend either Learning Nagios 4 which is a more recent book, or Nagios: System and Network Monitoring which is simpler but a tad older. Both cover the basics of a Nagios setup & config brilliantly and the writing styles work well for beginners. Once you get beyond the basics Nagios can be a fun & versatile tool. If you make the time to study and practice Nagios it will quickly become a staple in your devops/sysadmin workflow.